Speaking for myself, I am utterly delighted to receive the Sydney Peace Prize. But I must accept it as a literary prize that honors a writer for her writing, because contrary to the many virtues that are falsely attributed to me, I’m not an activist, nor the leader of any mass movement, and I’m certainly not the “voice of the voiceless”. 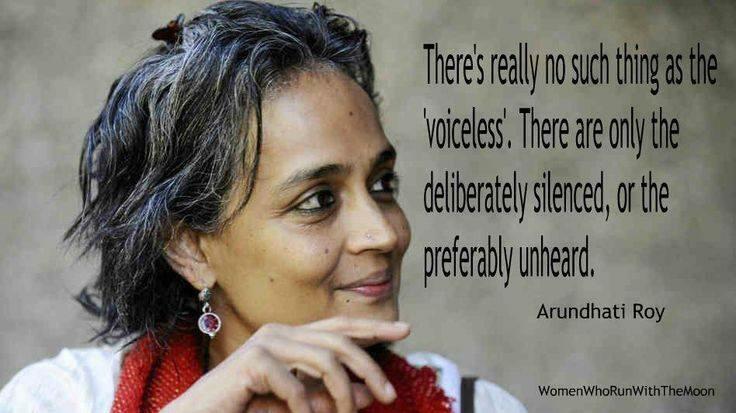 (We know of course there’s really no such thing as the ‘voiceless’. There are only the deliberately silenced, or the preferably unheard.) I am a writer who cannot claim to represent anybody but herself. So even though I would like to, it would be presumptuous of me to say that I accept this prize on behalf of those who are involved in the struggle of the powerless and the disenfranchised against the powerful. However, may I say I accept it as the Sydney Peace Foundation’s expression of solidarity with a kind of politics, a kind of world-view, that millions of us around the world subscribe to? It might seem ironic that a person who spends most of her time thinking of strategies of resistance and plotting to disrupt the putative peace, is given a peace prize. You must remember that I come from an essentially feudal country -and there are few things more disquieting than a feudal peace. Sometimes there’s truth in old cliches. There can be no real peace without justice. And without resistance there will be no justice.